Cucina Povera: Challah Back Girl! I love it when I eat something and I think to myself, 'I can make that' - It is fun to set yourself the challenge to replicate a dish or food you have tasted. I Especially love the thrill of the chase of hunting down a recipe or the ingredients to make it. 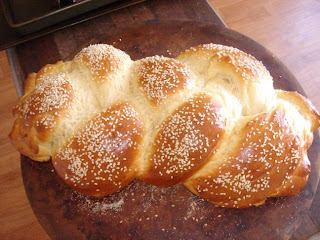 I have done this with Challah - Jewish Egg Bread. I only decided that I must make this bread myself after trying it a couple of times while in America. I also discovered that it makes the most sublime French toast and bread pudding. My mouth is literally watering just thinking about how good it is! I must stress that I only use the bread maker to make the dough. I let it do all the hard work of kneading etc. I can let the machine go on its merry way for an hour and a half while I do my own thing elsewhere. I then divide it into 3 pieces, roll out, plait and let rise for another 30 minutes before egg washing and putting into the oven. This bread is so freakishly easy to make and the results are better than perfect. I like to bake my loaf and then cut it into nice thick toasty sized slabs (nothing as petite and polite as a 'slice' here) which I can freeze in Ziploc bags for when I need a french toast fix. The taste... I would have to say is almost like a thick, warm, buttery slice of croissant. It is airy and flaky and just so very delicious. I can't find enough adjectives to describe how yummy home made Challah is. 1. Add ingredients to the pan of the bread machine in the order suggested by the manufacturer. 2. Run machine through 'dough' setting only. 3. Preheat your oven to 180C. Turn dough out onto a floured surface, divide into three and roll into long thick sausages. Pinch the three ends together and plait until you reach the end of your sausage, securing the ends by pinching together. (You can make it look neater by tucking the ends under if you wish). Transfer to your baking tray, lined with baking parchment. (I like to use a pizza stone). If you are hopeless at plaiting you might choose to just have a big hulking loaf - entirely up to you, I personally like how it looks when you plait it. 4. Brush your loaf with beaten egg and sprinkle with sesame or poppy seeds if desired. 5. Let sit in a warm place for 30 mins to allow the dough to rise before baking. 6. Bake for about 40 mins until bread is risen and is a lovely golden colour. 7. Try not to eat it all!